Good fortune smiled upon me last weekend. I live a few blocks from a local farmer’s market and I go there almost every weekend. Last weekend it happened to be raining (not hard, but definitely raining). I kind of like it when it’s raining a bit because it means that the market is less crowded! I also learned that you can get a steal of a deal from any outside bakery when it’s raining. This makes pretty good sense because baked good and rain don’t mix too well. I picked up a baguette and two small loafs of really good bread for just a few bucks. As I was walking home, I was kind of at a loss as to what to do with all this bread that just fell in my lap. When I got home though I saw that Panzanella salad had won the poll for the week! That kind of stuff never happens! Let’s just say that I was pretty excited to let one of my loaves of bread get stale. 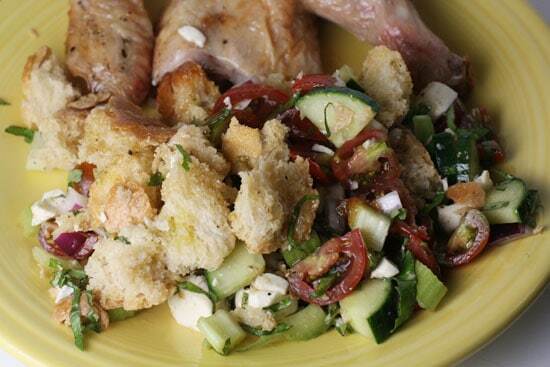 Panzanella salad is a great way to use old bread! Tossed with some fresh veggies and a bit of vinegar and olive oil, it’s fantastic. 1) Dice or rip your stale bread into chunks. If it isn’t really stale, toast the pieces in the oven at 250 degrees for a few minutes. 2) Drizzle about 1 Tablespoon of white wine vinegar over the bread pieces and let it marinate while you prepare the rest of the ingredients. 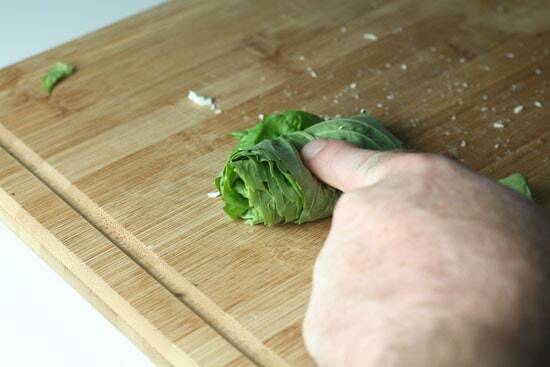 3) Chop up all the veggies and chiffonade the basil. 4) Toss everything together and drizzle in the olive oil and more white wine vinegar to taste. Also taste for salt and pepper. 5) Serve at room temperature. Adapted from the Capital Cooking Cookbook. 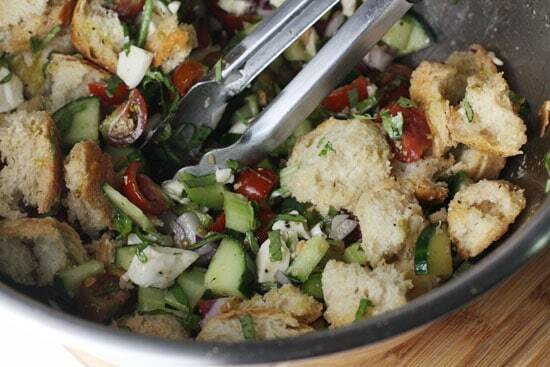 You can use a huge assortment of bread for this salad. Almost anything that’s a few days stale will work fine. 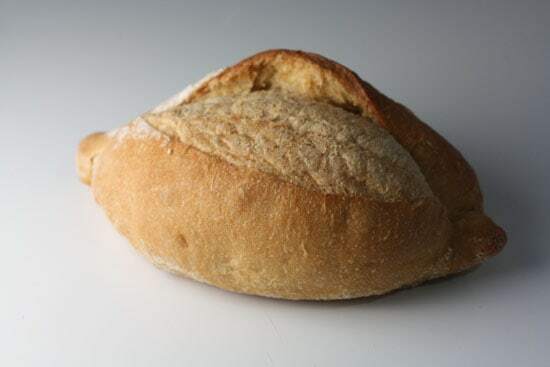 If your bread isn’t really stale, or if you’re using store bought sliced bread, toast the bread in the oven at 250 degrees for a few minutes to dry it out even more. Like I said, I use a loaf of bread that I basically stole from the bakery stand at the farmer’s market. This cost me $1. You can use almost any bread for this. Once you have your stale bread, rip it into pieces (or rip it into pieces and then toast it if you want it crispier). Add the bread pieces to a bowl and drizzle in a bit of white wine vinegar. I just eyeballed it, but I would guess I used 1 Tablespoon. Let that marinate while you prepare your other stuff. The other ingredients for this are pretty standard. Use the ripest tomatoes you can find and if you can try to find a European cucumber because they have smaller seeds, but if you can’t find one, no big deal. Ripe tomatoes are most important. 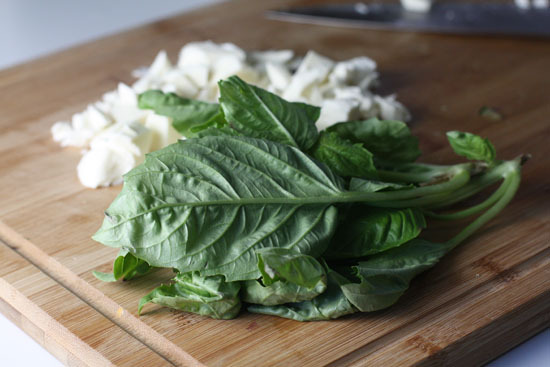 Some of the best flavors in this dish comes from a lot of fresh basil and fresh mozzarella cheese. 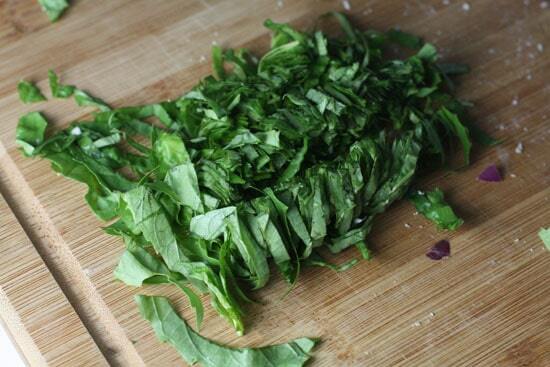 The best way to add basil to a salad like this is to chiffonade it. Sounds fancy. Looks fancy. But it’s dead simple to do. Start by taking all your leaves and stacking them on top of each other. Then roll them into a tight ball. The technical term is chiffonade. Combine this with all your other chopped veggies. 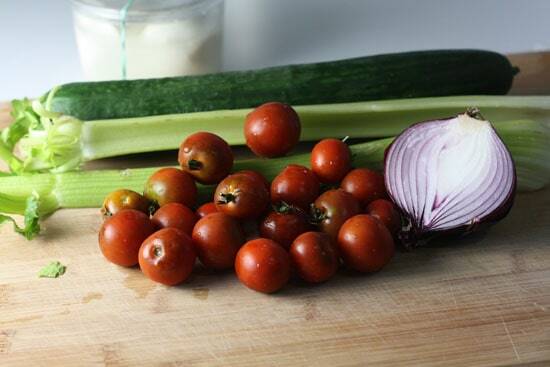 Mix your veggies in with your bread and drizzle in the olive oil and a bit more white wine vinegar to taste. Also taste it for salt and pepper. Plus the bread and oil. The best part about this salad is how some bits of bread are really crunchy and some are a bit soggy and flavorful. The textures are really great and the fresh ingredients make the flavors really pop. I served this salad as a side for a roasted chicken I made over the weekend. It was a perfect side dish for the chicken and reminded me a bit of the Zuni roasted chicken dish. I think this is maybe my number one way to use stale, leftover bread. Sure. You can make bread crumbs out of it or french toast or bread pudding (Mental Note: I need to make bread pudding). But in the hot summer, this just really hit the spot for me. So this looks amazing, and I am going camping next weekend in the Shenandoah sans fire pit. I was wondering how long, after combined, this will stay without turning into mush? Should I keep the ingredients separate? I keep trying to come up with food for lunch and dinner that is no cook but filling for a group of 6, it’s a challenge to say the least. You know what would be awesome? If you did a post on tasty food you can take camping that is no fuss? Thanks for the post idea Erin! To answer your question though… I’d probably keep the bread separate until you were ready to serve. You could combine all the other stuff though ahead of time. This recipe is from Chef Domenico of Assaggi and it was featured on our “Picnic Pleasers” episode. 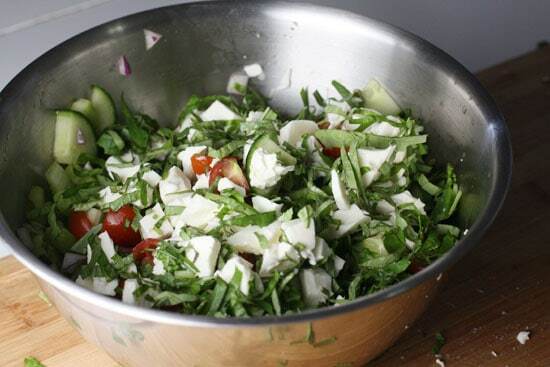 The chef recommends letting the salad sit together for 3 hours- 1 day to bring all the flavors together. One idea would be to lightly dress it before you go and then add more olive oil and vinegar when you serve it. It is a great picnic dish! My husband and I make a similar panzanella pretty regularly in the summer; we use bigger tomatoes and we skip the celery. (We got our basic recipe from the Kayotic Kitchen blog.) And we make it to be a meal all by itself. It’s delicious – and I don’t even like tomatoes. You should try adding pepperoni to it. It gives the salad a little bit of spice (and substance, if you’re a serious carnivore, like I am). Mmm, I’m a big fan of panzanella, which I haven’t had in a while. 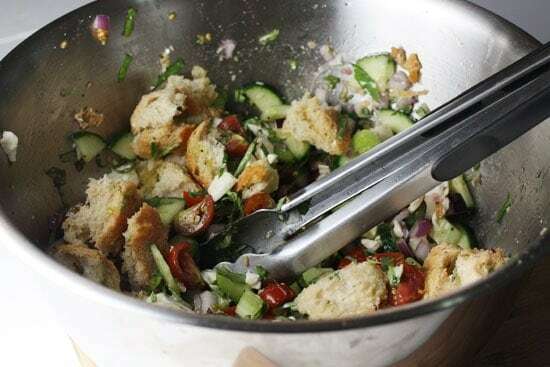 Seeing that photo of your basil chiffonade, has me smelling the flavors and so yes, it is time for a bowl of summer panzanella! Great idea for a summer salad. Haven’t made it in a long while. Thanks! I also like to toast the bread before adding it to the salad. I recently made one that's similar to yours, but with a bit of a twist. « Sun-dried Tomato Pasta Salad Recipes Home » Around The Internet Kitchen: Print Stuff!